Who (or What) is Behind Mexico’s Rising Drug Violence? Official data, as reported by AlJazeera in late June, indicates a drastic surge in drug violence and homicides in Mexico this year, with almost 10,000 reported homicides in the first five months of 2017, showing a 30% rise on 2016 statistics. But why exactly is violence on the rise in Mexico? And who is to blame? 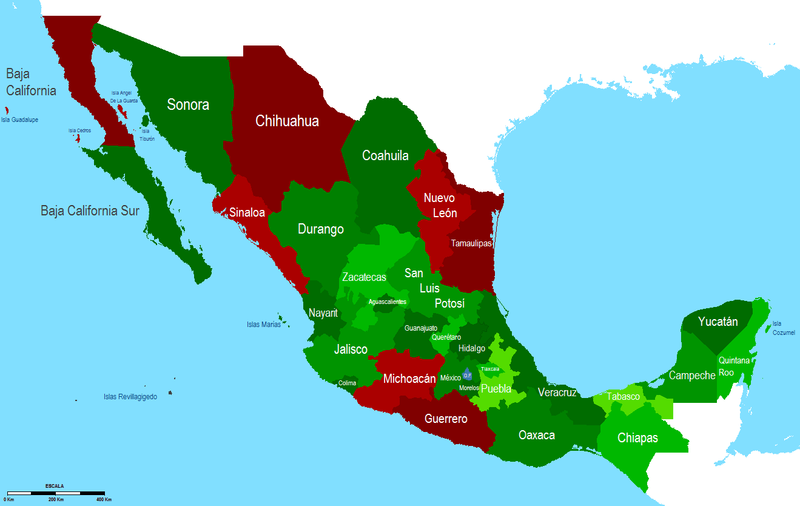 Many people immediately blame rising violence on Mexico’s many drug cartels, in particular the brutally violent Zetas, a cartel which maintains a presence in over half of Mexico’s 32 states. However, while cartels are to blame for carrying out many of these acts of violence, the chain of events leading up to them must surely also be considered. Take, for example, the Mexican government’s so-called kingpin strategy, initiated by then-President Felipe Calderón in 2006, which aimed to take down the leaders of the dominant drug cartels. Initially, the strategy proved successful and led to an almost immediate dip in organised crime activity, with many of the cartel leaders being captured or killed, and crops and weapons being seized. However, it didn’t last long and officials in particular began being targeted by cartels, although Calderón stood firm throughout the literally bloody aftermath, even at the funeral of one such fallen officer. What’s more, this take down of kingpins and major players also opened the doors for wannabe leaders to fight it out amongst themselves for control. For example, in Sinaloa, home of the infamous cartel once led by El Chapo, 2017 has seen the highest number of homicides in six years, with rival factions fighting for control. However, while it’s easy (and en vogue) to point fingers at the former Mexican leader whenever discussions of rising violence in the country come to the fore (especially considering that in the ten years since the start of his war on drugs some 200,000 lives have been lost as a direct result), we must consider that much of the rising violence has taken place under the charge of current president Enrique Peña Nieto. Therefore, it seems clear that the problem goes far beyond the well-meaning but misguided policies of one man. Others pin the origin of rising violence in Mexico, not on the Mexican government, but on the US influence over the Mexican drug market, both in terms of supply (of arms) and demand (for drugs). After all, it’s this very supply and demand which keeps the drug industry going in the first place, ensuring the cartels keep power which ultimately contributes to the continued violence in Mexico. The US allegedly sends 2000 guns across the border daily, many of which likely find their way into the hands of cartels. What’s more, the US is also the largest consumer of drugs in the world, with even Trump’s advisors admitting that US drug demand is contributing to ongoing violence in Mexico. In fact, it’s estimated that some 90% of the cocaine in the US comes through the Mexican border. Some counter this assertion that the US is behind Mexico’s rising violence by putting forth the fact that the US has heavily contributed to the Merida Initiative though, a programme which pumps US funds into disrupting organised crime. While this is certainly the case, the US influence over the Mexican drug market and the consequences of that influence remain clear. However, whichever way you look at the issue and whoever or wherever you believe the root of the rising drug violence issue to lie, it could be said to all boil down to the same issue: corruption, greed and a startling lack of morality which plague both the Mexican government and, to a lesser but arguably just as insidious a degree, the US government too. Reports assert that members of the Mexican government, the intelligence communities and even Mexico’s Interpol branch have been compromised by hefty bribes from cartels in the past. Similarly, and according to Newsweek, The New York Times reported that 100,000 soldiers deserted the Mexican army in recent years and the likelihood they turned in their weapons is slim. Ultimately, due to the complexity of the drug war in Mexico and the associated wave of rising violence, its practically impossible to pin on one person, one institution or even one country; catching a kingpin won’t take down an empire, nor will the US pumping money into fixing a problem to which they are indirectly (and in some cases, directly) contributing. Given all these factors, then, it seems unlikely Mexico will see a resolution to its violence problem anytime in the near future.